This is a guest article by Paul Pelletier, LL.B., PMP. 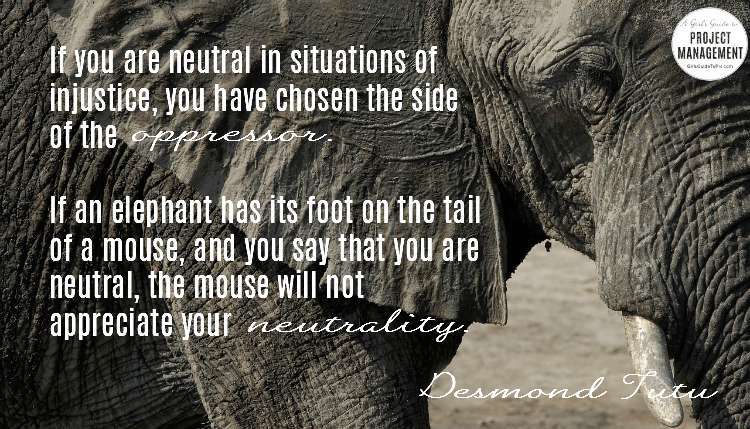 This quote applies to bullies as well as it applies to elephants. Bullying can be as harmful in the workplace as it is in schools and other areas of society, causing the well understood personal emotional impacts plus a long list of challenges for project manager and their organizations where it is taking place. Projects are subsets of workplaces and since project management is, for the most part, an activity that involves working very closely with others, the impact of a bully in a project is potentially lethal to project success. To complicate matters, workplace bullies are often hard to identify clearly. 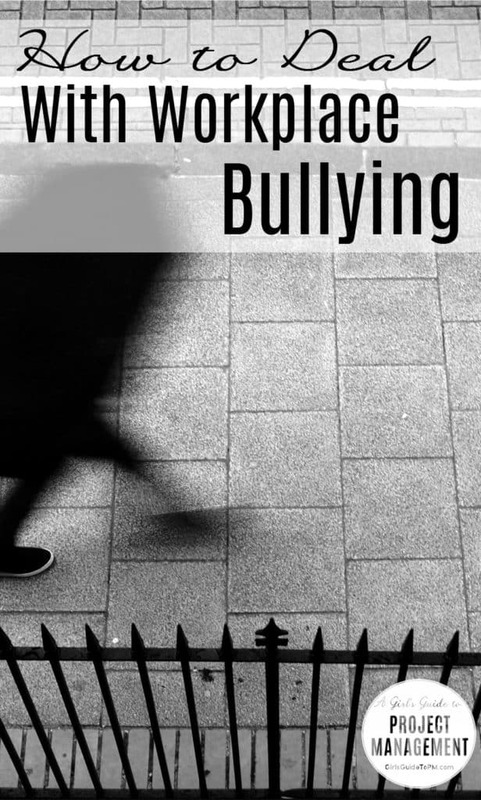 Bullying is a tactic used by the perpetrator to get ahead in the workplace. The bullies are often highly skilled workers who are socially manipulative, targeting those who threaten their career path while adroitly charming those who serve it well. Thus, a senior manager or their supervisor may say, “That person seems great to me” or “She always gets results.” Remember, while good employers purge bullies, most promote them. In other words, the Code says that neutrality isn’t an option. The Workplace Bullying and Institute (WBI) defines workplace bullying as “repeated, health-harming mistreatment, verbal abuse, or conduct which is threatening, humiliating, intimidating, or sabotage that interferes with work, or some combination of the three”. It is a laser-focused, systematic campaign of interpersonal destruction. It has nothing to do with work itself. It is driven by the bully’s personal agenda and actually prevents work from getting done and after all, that is precisely what project managers are responsible for doing – getting project work done through the efforts of others. The abuse runs the gambit from insults or offensive remarks, to giving unmanageable workloads, to withholding pertinent information, to inappropriate email or social media, to stealing credit for work. There is a wide range of direct negative and financial impacts which bullying has on projects. The most obvious are impacts on project success, team performance, budgets and timelines. Shane Cowishlaw, writing on Stuff.co.nz reports that workplace bullying costs New Zealand “hundreds of millions” of dollars. Australia reports losses in the billions. Not surprisingly for companies in the much larger United States, workplace bullying-related costs are estimated to be over $200 billion. How does a project manager deal with an organizational culture of bullying in the workplace? This is a complex question that I have created an entire presentation and workshop on. The best short answer is to appreciate what is within your realm of control and influence in order to create an action plan. For example, you may quickly observe that these cultural norms aren’t adopted by the whole organization but seem to have evolved in your unit. That may give you an opportunity of influence outside the unit. Read Next: Check out the 6 principles of stakeholder engagement for a better way to work with a team than the bullying behaviour described here. Alternatively, you may see the senior management adopting a disrespectful tone and exhibiting poor leadership skills. Take time to learn and observe those with influence (i.e. senior management, human resources staff, your manager). Consider what information would be needed create the most impactful and effective strategy to present a complaint? How would you obtain this evidence? Document every incident of unacceptable behavior in detail. Consider whether you have any colleagues willing to join forces with you – there is power and credibility in numbers. Realistically assess the risks and challenges you would face if you raised the flag. Be courageous but sensible. With all the information in hand, create your action plan. Consider this a project. Be strategic, focused and patient. Plan – only move ahead when you are ready. Be prepared for conflict and challenges. Always have a strategy to protect yourself, and your health. It is possible that the best strategy is to think about how to develop your organizational exit plan. You may not be able to change this toxic workplace but you can leave a message about why you left and move onto a harmonious workplace. 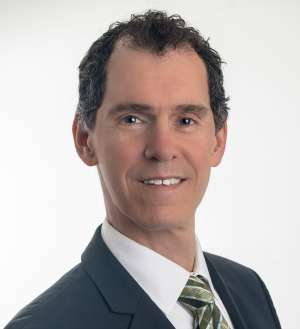 About the author: Paul Pelletier, LL.B., PMP, is a senior executive, corporate lawyer and management consultant specializing in workplace respect. He has over 25 years of management, legal, and PMO, portfolio and project management experience. He serves as member of the PMI Ethics Member Advisory Group. He is a regular presenting at international project management conferences and on ProjectManagement.com. His website is www.paulpelletierconsulting.com. Paul’s book, Workplace Bullying: Its Just Bad for Business* is available on Amazon. * That’s an affiliate link, but you won’t pay any more even if you click it. Hey Elizabeth and Paul, this article really caught my eye and is something I’m very interested in with my EI focus. Workplace bullying can, as you say, sometimes be very subtle – with bullies sometimes preferring to prey on someone’s doubt or inexperience. This is where things can become really ambiguous – is it “bullying” or is it “clever use of influence”? In project management land, influence is sometimes all we have so understanding the intent behind its application is crucial. I recall a time years ago when I was with a professional services firm managing a project for a client. My project was running late, but the client knew that and was okay with it. Since we were late, however, the revenue from that project would have spilled into a new fiscal year, potentially hurting earnings. I was new to the vendor side of things and the salesperson associated with the account asked me “what about your revenue commitment?” I didn’t know what the hell she was talking about until she tried to insinuate that I needed to bring resources onto that project ahead of schedule so our firm would be able to bill for them – even though we weren’t ready. She also suggested my job might be on the line if I didn’t. I never forgot that incident – not just because it was very upsetting (which it was), but because it forced me into a choice, the outcome of which would directly affect my project (since I was the one actually managing it). 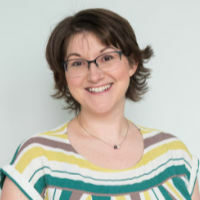 I think this topic of bullying in project management is *very* important because its consequences can reach far beyond the bully’s target and have important impacts to a project’s future success. Thank you for your story and feedback. Sounds like you were openly threatened and the language used is typical of a bully. However, as you say, it’s also typical of someone under stress with different priorities who is asserting her influence (albeit in an inappropriate way). It wasn’t very subtle but the key to determining if there is a bully at play is the existence of a pattern of behaviours. A single event is often someone responding poorly to a crisis or not thinking before speaking. Often, when you raise the issue afterwards (and I recommend that you do), a sincere apology results. Multiple events represent a much different issue and require using your knowledge in order to draw reasoned conclusions. Given your EI focus, this is absolutely an issue that is of importance. I agree that, especially at first, much bullying-type behaviour is hard to classify. Is it rudeness? Is it disrespectful? Is it bullying? Is it harassment? Or even worse, is it discrimination? The answer isn’t often clear and that is why it’s important that everyone understand the nature of workplace bullying, how it impacts people, projects and organizations, what is going on and how to cope with it. I’m giving a webinar on “Coping Strategies for Bulling in PM ” on PM.com on Sept 16. You might want to attend. The work that my consulting firm does with our clients often starts with awareness/educational training. In quite a few cases, that triggers a realization that the organization has instances of bullying going on which leads to more in-depth work (creating Respectful Workplace Policies, investigations, conflict resolution, in-depth training). Thanks for sharing your experiences, Geoff. Great article. It gave me cause to think about those times when I had heard about this behavior but had not witnessed it. It seemed very unreal at the time. Have you heard any stories of bullies getting walked out or fired, as opposed to promoted? In my experience, when confronted by these people, the other staff often leave quickly – so quickly it’s noticed by management. Good management takes on this test with inquiring and open minds – incompetant management doesn’t know better. Thanks again for bringing up this conversation. It’s one we should probably have more often. Thank you for your comments and feedback. You are absolutely right – good management addresses the problem head on – but with fairness, confidentiality and thoroughness. I do know of stories where the bully has ultimately been fired. Unfortunately, this event only occurred at the point where the business had no choice or they could risk being in very unpleasant legal, reputational or financial hot water. Usually, it’s after the bully has caused significant negative impacts to the organization. In other words, when the evidence about the problem was irrefutable. Sadly, rare is the organization that has effective leaders, processes and staff to deal with the problem from the moment it starts.